Entry Fee is $125 per person. Fee includes Lunch, Welcome Gift, 18 Hole Golf, Shared Power Car and Range. Prizes & Presentations Immediately Following play. The first 144 paid entries will be accepted. Anniversary Cake provided by New Horizon Cooperative Ltd. So there you go, your weekend should be all planed out now! Oh, and that little surprise I had for you? This isn't actually being released until Friday - but you can have a sneak peak. ... you're welcome. Well, it looks like the summer holidays might have had something to do with Laurie's report this week - it looks like she had a little help providing some of her content too! I asked the summer students who are running programs to provide an update on how it's going. There's a lot of reading going on in Grande Prairie this summer! Partners in Reading is currently in its fifth week. We have 55 dedicated volunteers and 57 students participating in the program. So far PIR has been running smoothly, partners are getting to know each other, doing a lot of reading, and playing literacy games together. There are three weeks of reading left and we will conclude with a party to thank the volunteers and commend the children’s efforts. The TD Summer Reading Game is half way through and most students have already received several prizes from our laugh out loud loot! Over 650 kids have registered, close to 20 children have taken advantage of our "write your own story" option for bonus prizes and over a dozen children have been invited to the LOL party! Most impressive of all, a handful of quick kids have already read 24 hours or more and have entered in one of the Grand Prize draws! Children are reading steadily and are diligently recording their minutes. This year has been another successful summer and the children keep coming back for more! LOL programs, including the program for 8 to 12 year olds, 6 and 7 year olds and the French program, are extremely well attended! Week after week, familiar faces as well as new ones, are welcomed into the story room for funny games, crafts, stories and other activities. The new teen "I like the book better club" is increasingly popular. We have already managed to read books and view the films of many contrasting genres. Most teens that have come once, almost always come back again, confirming that the program is running its purpose and may become an ongoing program here at the Grande Prairie Public Library. The Teen Reading Challenge continues to be well utilized, as teens have entered in weekly draws both online and in the library. The Adult Summer Reading Program is going well - 180 Reading Logs have been picked up! So, all ages are reading up a storm this summer. All the best with the 50th Anniversary festivities. You'll need a holiday when it's all over. Thanks for the update Laurie (and friends!). Speaking of the 50th Anniversary Homecoming Weekend, I'll have an update for you tomorrow that covers all the activities that are planned for the weekend... and there are lots! Every now and then I pop in to Google to see if there are any new local blogs providing information on Grande Prairie. There haven't been too many lately but there is one great site that I've neglected to mention. Although not exactly a blog (ok, not a blog at all really) DiscoverThePeaceCountry.com is a great site that has tons of information on the whole Peace Region. My friend Ken has been running the site for at least eight years. In addition to on going updates on GP's business news he's also travelled the area and provides great information on many parks and recreation areas. Ken has a media background so the information is detailed and he has some great photo galleries. Most recently he's put up galleries covering Street Performer's and the Canada Day Parade. (see if you can spot me on my bike in the Canada Day gallery). So, pop on over to Discover The Peace Country - it's a great resource and I've added it to the Worthwhile Sites section on the right hand side of this page. Just a quick note tonight ... 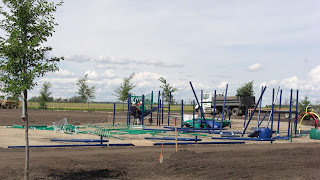 I had to share my excitement with how J.C. Mackie Park is coming along. 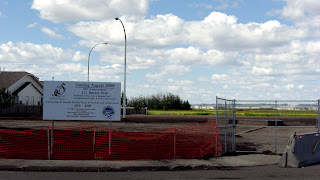 In case you hadn't heard, the park is named in honour of Mr. J.C. Mackie who was mayor back in 1958 when Grande Prairie became a city. It will be GP's first fully accessible playground - meaning it can be used by people in wheel chairs as well as those who have full mobility. It's pretty cool and I am very excited to see it take shape. The park is a project of the 50th Anniversary Committee and should (hopefully) be ready in early August. * In response to a question in the comments: Mackie Park is at 111 Street and 106 Ave. that's just north of Emerald Gardens, behind Home Depot. It's an area with lots of high density housing and little green space so I'm sure the park will be a welcome addition. Anne of Green Gables Turns 100! Come celebrate Anne’s birthday at an afternoon tea in the Story Room. Period dress encouraged. Cordial and dainties to be served. Door prizes. All ages welcome. Registration required. Telephone 532-3580 ext. 226 Wednesday, July 16 from 3:30 – 5:00 p.m.
Have you ever thought, WOW! That movie was way better than the book! On the other hand have you ever been disappointed by a movie version of a novel? Starting July 2nd every Wednesday night we will be watching and discussing if we do in fact “like the book better”. Come to the Story Room at 6:00 pm to munch on popcorn and view the best and the worst of movies based on popular novels. Selections include The Golden Compass, A Walk to Remember and Eragon. For ages 13–19. Call Sherrie or Heather at 532-3580 ext 226 for more information. Discover the latest summer reads at your Library and win prizes.Keep track of the books you read or listen to between July 2 and August 31. Read 2 books or listen to 2 books (tape, CD or downloadable eAudiobook) and be eligible for prizes from Esquire’s Coffeehouses, the Leisure Centre and the Grande Prairie Museum. After reading or listening to six books, complete your reading log and enter your name for the Booklover’s basket to be drawn in September. Reading logs will be available from the Circulation Desk or online at www.gppl.ab.ca. Win great prizes this summer by participating in the Library's Teen Reading Challenge! Read two books and then fill out a draw form for our weekly Prairie Mall gift cards and the $200 shopping spree Downtown! Also, you can sign up online. The TeenSRC website at teensrc.ca offers booklists, a place to write book reviews, book club chat sessions, and a chance to win great weekly prizes. Call Sherrie @ 532-3580 ext 226 for more information. Writing Contest Anthology Now Available! 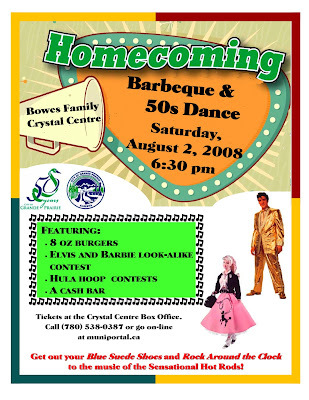 The homecoming BBQ promises to be a great family night on a weekend full of fun. "... a high energy 5 piece band playing 50’s rock'n'roll. 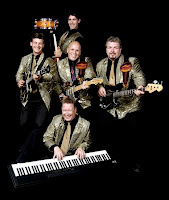 The Sensational Hot Rods perform auditoriums, outdoor concerts and special events. Their stage antics radiate to the audience that fun is the order of the day and just try to keep your feet from dancing. You'll have a hard time doing that when you enjoy 'The Sensational Hot Rods'. " It's going to be a unique night and a lot of fun so even if you have moved away from Grande Prairie, consider this a personal invitation from me to you; join us for the night. We'd love to have you back! You can purchase your tickets online by going here. To visit the team's website go to www.xof1.com where you can find out more about the project and the car. As I noted in the video they are still looking for sponsors to help the complete the 10,000 mile journey from Buffalo NY, to Inuvik and back. If you or your company can help please get in touch with them. * In the video I mistakenly called Marcelo da Luz "Marco" ... I guess my ad-lib skills are only so good, sorry Marcelo. 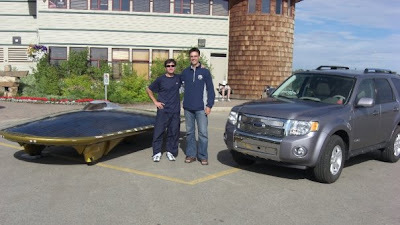 Ok, sure; his solar car uses even less gas than my hybrid. But I think it's fair to say I win hands down in the passenger comfort department. I have cup holders. Art Board Auction Closes Soon- Get Your Bids In! The Centre For Creative Arts hasn't had it easy while their current building is being renovated. They've had to make due with temporary home in the old RCMP station. Commendably, they are still working to offer programs and space for small art based businesses. Additionally , as they look forward to getting back to their rightful home (is it done yet - is it done yet?) they are putting on the second annual Art Board Auction to benefit the Healing Arts Program. 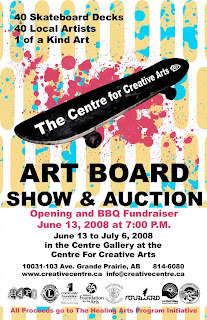 "One of the most successful things we do at the Centre for Creative Arts is to bring art programs to groups and individuals who may not have the opportunity to experience such activities in any other way. This program is open to Grande Prairie and Area groups and organizations between September and June of each year." You can support the Healing Arts program by bidding on a one of a kind Art Board - but time is running out! The auction closes on July 6th at 3:00pm... you have to have your bid in by then! Go here to see all the Art Boards and to place your bid!